Do you know what the biggest difference is between a casino and a church? Well, when you go to a casino and pray for some luck, you actually mean it. Don’t believe me? 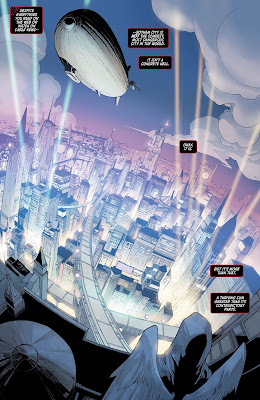 Then please check out the following adventure created by Scott Lobdell, Stephen Segovia, Rex Lokus, and published by DC Comics in April, 2019. Amen. 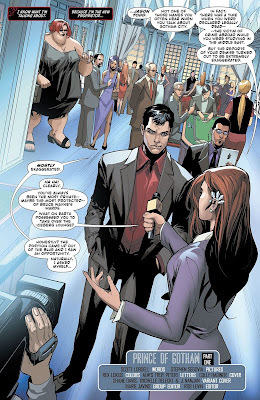 When Bruce Wayne last saw Jason Todd, he told him that his alter-ego, The Red Hood, isn’t allowed to return to Gotham City, ever, ever, again, without mentioning anything about Jason himself! First and foremost, please allow me to say that Scott Lobdell doesn’t waste any time when it comes down to establishing Jason’s new status quo. Primarily, he does this by quickly skipping much of the build-up, while adding a couple of mysteries into the mix. After all, how and when did Jason go from being a drifter to the brand new owner of the Iceberg Lounge? Why did he hire his enemies, the Su family, to help him run his business? 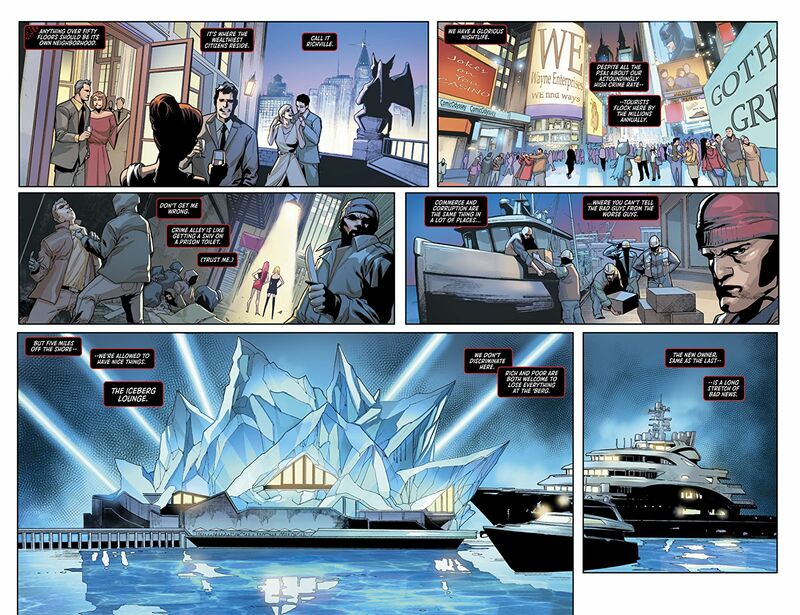 And what will Jason’s actions be now that he’s the head of The Penguin’s empire? These questions, plus many, many more, are just a few that are well worth asking, and directly makes “The Prince of Gotham” a really great introductory episode. 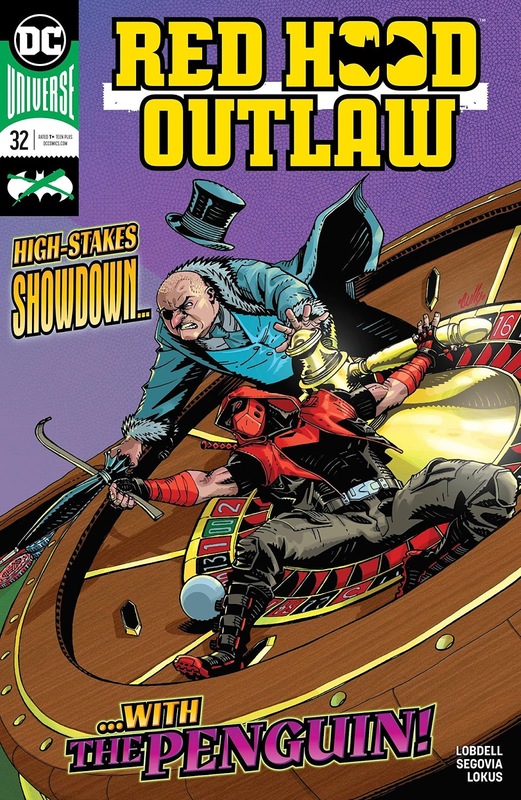 Not only because they’re strong, solid hooks that will keep the fans coming back for a second helping, but in addition to this, they will also provide Lobdell with the required focus so he can avoid the feeling of just ‘going through the motions’ I noticed during the previous story arc, “The Outlaw”. Well, with all due respect, I say this because issue 32 was a real pleasure to read, and I particularly enjoyed that short scene between Jason and Batman. In fact, it was my favorite part of the whole book, since it clearly shows Jason’s new attitude towards his foster father (confident, bold, and full of beans) as well as how he currently sees himself (comfortable within his own skin). Now, where the art is concerned, the series’ regular penciller, Pete Woods, is taking a well-deserved break this month, which is why Stephen Segovia is stepping in as his replacement. Well, as some of us know, Stephen isn’t a stranger to the world of Jason Todd, having pencilled the final issue of Tynion’s run back in 2014 (RHATO V1 #31). Yet, while his work there was generally good (more or less), his work here shines even brighter because his noir style is an obvious fit for Lobdell’s script. Heck, just take a look at the beautiful way he renders the inside of the Iceberg Lounge, doing so by filling it full of glamour and pizzazz. Or alternatively, check out the amount of confidence he injects into this version of Jason Todd, which is in stark contrast to the way Pete drew him during the previous story arc. Also, another notable mention; would have to be Stephen‘s faithful and unique adaptation of the Su siblings, keeping in mind that they were originally designed by Kenneth Rocafort, who’s one of the more distinctive artists in the business. Seriously, folks, this isn’t an easy thing to do, considering Rocafort’s prolific track record, and if truth be told, I wouldn’t mind it if Mister Segovia were to become the series’ regular artist. Funnily enough, Rex Lokus also seems to be on top form this month. Although, in his case, I think this has something to do with him getting used to the tone of this book, or else, his hues are far more compatible with Stephen’s style of illustration. 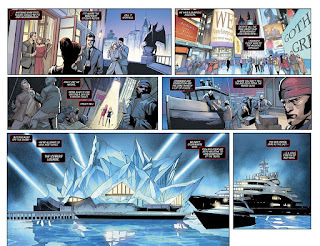 Either way, his colors are crisp, clean, and perfectly convey the expected lavishness of the exclusive Iceberg Lounge, while giving every single character (regardless of their status) a distinctive appearance through his coloring skills. 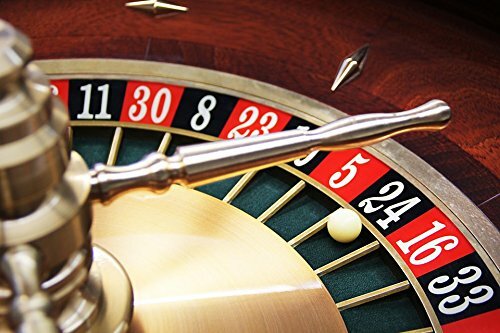 For this month’s musical match-up, I’ve selected a tune with strong lyrics, a pounding beat, and a bad attitude similar to those conveyed by the punters that place bets at Jason’s brand-new casino. So, without any further ado, say hello to Mötorhead’s ‘Ace of Spades’, and try to keep an ear out for the phrase, “It’s all a game for me”. As the main setting for this episode is set inside a casino, how could I not select gambling for this month’s comic book comparison? Besides, Jason’s plans are leading him down a dangerous path paved with all sorts of obstacles that might stop him from achieving his goal. So, if he hits it big, he hits it really big. But if he fails, well, in that case, he will find himself in a cozy cell at Arkham Asylum; courtesy of the city's bat-themed bouncer. Scott Lobdell, Stephen Segovia, and Rex Lokus have surprised us this month by producing a strong issue that properly capitalizes on the ending of the previous arc, turns around what we knew about Jason, before setting the stage for a new story that promises to take him into an unexpected direction. So, with that said, what are you waiting for? Pick up this issue today and add it to your collection.